Rachel Carson an American Marine Biologist and Conservationist, founded a public awareness of how man made toxics in our environment are contributing to a legacy of death and despair. 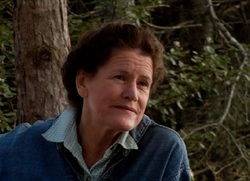 Her 1962 book "Silent Spring" characterized a vision of toxic impacts on the environment including wildlife and human health issues that still resonates. In the decades since Silent Spring, movements have risen, awareness has increased, and yet the toxic stew that we are all immersed in continues unabated. Scientific research by individuals such as the epidemiologist Dr. Theo Colborn and her stunningly comprehensive 1996 book, "Our Stolen Future" have done little to stem the rising tide of human made toxins in our enviornment. This book exposes the sunami of human illnesses linked to man made chemicals including pesticides and the literally thousands of other toxic substances used to make virtually every consumable product imaginable. The consequences of our cultural investment in creating deadly poisons and exposing every living creature on the planet include endocrine disruption, cancers, and mental disorders. 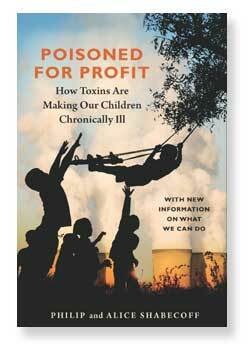 In a remarkable book published in 2008 Poisoned For Profit, -how toxins are making our children sick, Philip and Alice Shabecoff discover that "the children of baby boomers, the first to be raised in a truly toxic world have hight rates of birth defects, asthma, cancer, autism, and a frightening range of other neurological illnesses. One in three children born in the United States today have an illness that they will suffer from for their entire and sometimes shortened lives". The book links these illnesses to man made toxins that humans are exposed to "from fetus to adulthood, in our homes, yards, schools, cars and busses and playgrounds. The assault is everywhere: air pollution, water pollution, pesticides, mercury and lead, industrial solvents, food additives, artificial growth hormones, arsenic, bisphenol A, and phthalates in bottles an teething rings and other plastic products". More importantly this book is a detective story with research that demonstrates that corporations and monied interests that profit from these man made toxins have gamed the system in order to produce the products. They have done this through routine obfuscation in the media by deliberately generating misleading controversy, scientists for hire, lobbyists, lawyers, cynical public relations strategies, and government collusion. ﻿GreenWatch Special Report:﻿ "A Sepulcher of Profit"
﻿Mother Jones, March 2014:﻿ "How Industry and the Feds Suppressed Evidence That Plastics Wreak Havoc on Our Hormones"
Perpetrators- Links to documented evidence of chemical company misdeeds, malfeasance. The U.S Toxic Substances and Control Act of 1976 is one of the fundamental U.S. Laws addressing the use and spread of toxic substances. It was originally passed in 1976 under President Gerald Ford. It is antiquated and according to many including the Safer Chemicals, Healthy Families Coalition it has numerous flaws including: lack of regulation of products like toys and food; only 200 of the original 60,000 chemicals approved in 1976 have been tested and only 5 substances have been banned; and 80,000 chemicals are in the contemporary marketplace. Click Here for a link to the SCHF analysis. this is an overhaul of the ancient Toxic Substances Control Act of 1976. It is currently languishing before the republican controlled congress and targeted for not passing. the updated Safe chemicals Act of 2011, if passed this updated law could help bring the USA into a responsible position regarding the world wide use, dispersal, spread and unregulated manufacture and consumption of toxic products. If passed, there would still be hell to pay, but, if passed it would provide more protection for Americans and allow the United States to join three important international treaties based around the Stockholm Convention of Persistent Organic Pollutants signed by 174 nations. According to the Healthy Families Coalition, the passage of this act would allow the United States to lead international efforts rather than stand by while allies and trading partners make important decisions.